Hi everyone -- it's been a busy couple of weeks, with my daughter's first overnight field trip to the state capitol and her lead role in her jr. high musical, my younger daughter's numerous after-school activities and of course, all the usual back to school stuff. I'm sure you all can relate--hey, it's October already! Since Halloween is coming up quickly, I wanted to share a post from the archives about a reader-favorite edible nut-free Halloween haunted house project. 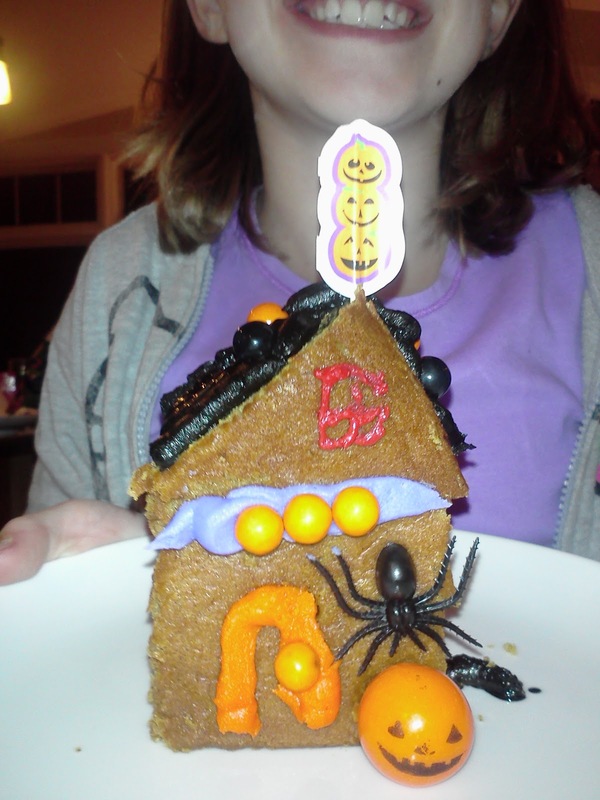 Click this link to learn how you can create a mini "haunted house" out of a delicious pumpkin cake -- nut free, of course. Nut-free candy corn is always a big request this time of year and I've got a post devoted to that, (click here), but I wanted to share a new find at the supermarket. 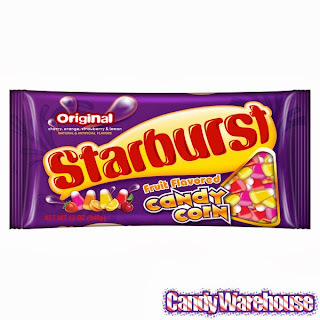 Starburst brand makes fruit-flavored candy corn. I've dealt with them in the past and it seems they will label for "may contains" but of course, if you have questions, call them. I found these candies at SuperTarget in the Halloween section and also at my local supermarket. Another great source of peanut-free, tree nut-free, gluten-free candy is Tootsie Roll. Here's a post I wrote about them last year. They make many candies that have the "nut-free" symbol on them. If you are looking for a candy that is not only free of allergens but also artificial flavors and colors, please check out Surf Sweets organic gummies. 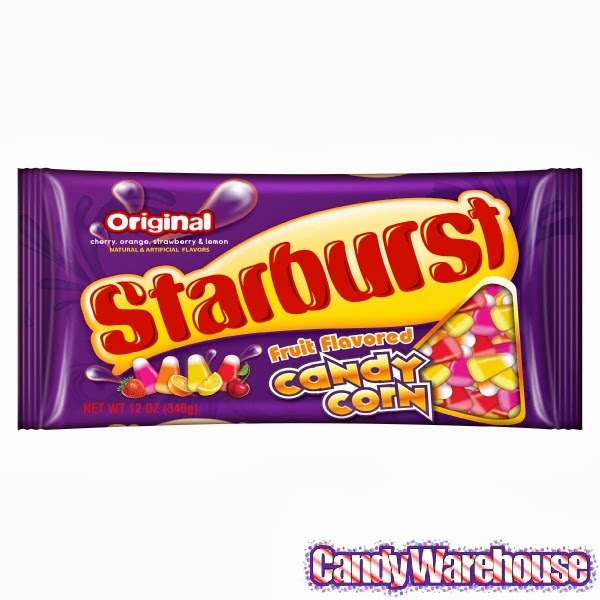 They're a longtime site sponsor and they make amazing candy. Check out "Spooky Spiders" (pictured to the right of this blog) and they make other seasonal candies, too. Available at Whole Foods and natural foods stores as well as other stores where they sell organic goodies. Of course, you should always check any food to make sure it is right for your exact situation. That brings up another good point. This blog is more than 5 years old and so, if you see a food from a post that is several years old, please always re-check it. Unfortunately, things can change; I make a good effort to stay on top of changes, but something can slip past me. Also, if I'm talking about a specific food, I try to give info that is very specific to that food and where/how it's manufactured. The larger food companies may have dozens of manufacturing facilities that affect the allergenic qualities of a food. One type of food from a company or brand may be made in a nut-free facility, while other foods from that company may not be. Confusing, I know, so it pays to check labels and call companies or e-mail them if you need more answers. Has anyone found any new nut-allergy "safe" candies on the shelves this Halloween season? Let us know. Also, be sure to check my Pinterest boards for nut-free Halloween treats and ideas. A direct link to my Pinterest boards is available just by clicking the "P" button to the right of this post. I'm adding to those boards regularly and it's a nice convenient place to find good stuff. Hope to see the Pinners there! Again, another brilliant and painfully adorable idea. I just love Halloween to no end! I am attempting to make as many new Halloween recipes as possible and now you've given us some fun new ideas!